ALMOST BLUE Worthington communes with his avatar in perhaps the most expensive sensory extravaganza — er, movie — ever made. Great illusions are their own justification. The panorama, the magic lantern, the stereoscope, the film — each generation brings us a new trompe l’oeil trick to transport us places we can’t really go. And now, in an age when people feel blasé about computer-generated effects, James Cameron has made a distinct leap forward by bringing us into the world of Avatar. In this movie, thanks to the magic of motion capture, creatures made of code seem as solid as human actors, equipped with all their minute changes of expression. An alien landscape unfurls before us, as vivid as Coleridge’s Xanadu (or the cover of a prog rock album, which it often resembles). Here’s the thing, though: While technology has made astonishing strides since Cameron started making movies, his story telling techniques have not budged. If you don’t mind having your transcendent visual experience laced with clunkers, you should enjoy Avatar. The most interesting thing about the movie’s plot is that it’s really about itself — or, anyway, about the double lives some of us lead via technology. Once, the Sanskrit word “avatar” meant a god’s physical manifestation on Earth. Nowadays it’s used by video gamers to refer to their virtual substitutes in the game world. You may be aging, obese or bedridden, but your avatar can remain a wasp-waisted, feline-faced, blue-skinned bodybuilder capable of leaping off cliffs with nary a scratch. Pandora has an atmosphere humans can’t breathe, however, and it’s already occupied. In a half-assed effort to reconcile the natives before the bulldozers roll in, a scientific team led by < ahref="http://www.imdb.com/name/nm0000244/">Sigourney Weaver grows big blue alien bodies that humans can “remote-control” with their brains while their own bodies lie dormant. Weaver and her buddies geek out on the alien language and culture, but the Marine is mainly excited about getting his legs back. Until, that is, he gets in his new body and meets his first genuine Na’vi (Zoe Saldana), who turns out to be a smokin’ chick. Eager to learn the secrets of her psychedelic rainforest habitat, Jake goes native faster than you can say Dances With Wolves — a development that doesn’t please the gung-ho colonel (Stephen Lang) who wants to use him as a spy. For the human scenes, Cameron appears to have copied and pasted from his old scripts: The slimy, waffling company man (Giovanni Ribisi) and the spunky Latina Marine (Michelle Rodriguez) are people we met back in Aliens. The Na’vi have their own language (and 3-D subtitles are a thing of beauty), but their culture and beliefs are your standard-issue New Age faux-indigenous stuff. They appear to lack internal squabbles — and a sense of humor. If Cameron had hired someone from Studio Ghibli to design the Na’vi and paced the movie better, he might have made us tremble at the beautiful strangeness of this culture the way we trembled at the sight of the flooded chambers of the Titanic. 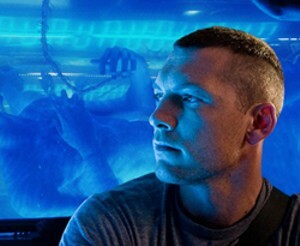 With its candy colors and B-movie plot, Avatar stays too cheesy to attain that resonance. All the same, it’s a sight to see, and many moviegoers, like the hero, won’t want to leave this virtual world. The experience of being seduced through our eyes is as compelling as it ever was. Too bad a smart spectacle is the real unobtainium.